The infusion of an Indo-European (Iranic) language, culture, and genetic element into the Kurdish population over the two millennia preceding the Christian era also entailed the incorporation of Aryan religious practices and deities into indigenous Kurdish faith(s). 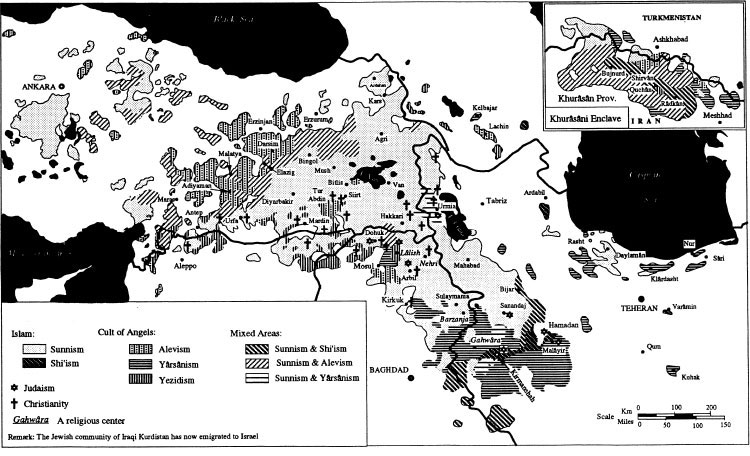 Zoroastrianism, Judaism, Manichaeism, and Christianity successively made inroads into Kurdistan. The most holy of Zoroastrianism’s three grand fire temples, that of Âzargushasp, was built at the holy site of Ganzak (modern Takâb) in eastern Kurdistan in the northern environs of the Kurdish city of Bijâr. The imposing ruins of the temple are still extant. Despite this, Zoroastrianism did not succeed in converting any appreciable proportion of the Kurds. In fact, it was the indigenous Kurdish religions that, in addition to deeply influencing Zoroastrianism, on two instances attempted to absorb that religion. 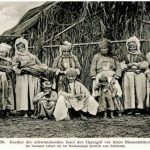 There also existed a large community of exiled Jews in Kurdistan from the time of the Neo-Assyrian Empire. These exiled Jews, according to the Talmud, were granted permission by the Jewish authorities to proselytize and succeeded spectacularly in converting nearly all of central Kurdistan to Judaism. Christianity was even more successful. 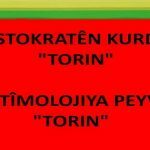 Large numbers of Kurds in far western and central Kurdistan converted to Christianity. 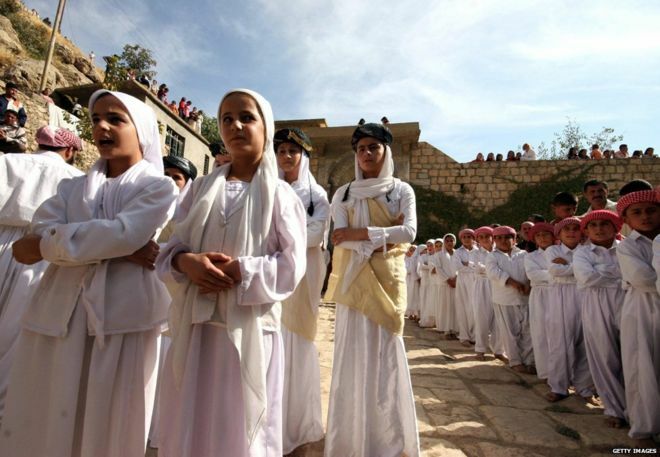 The introduction of Christianity was soon followed by Islam, which added further to the religious diversity of Kurdistan. 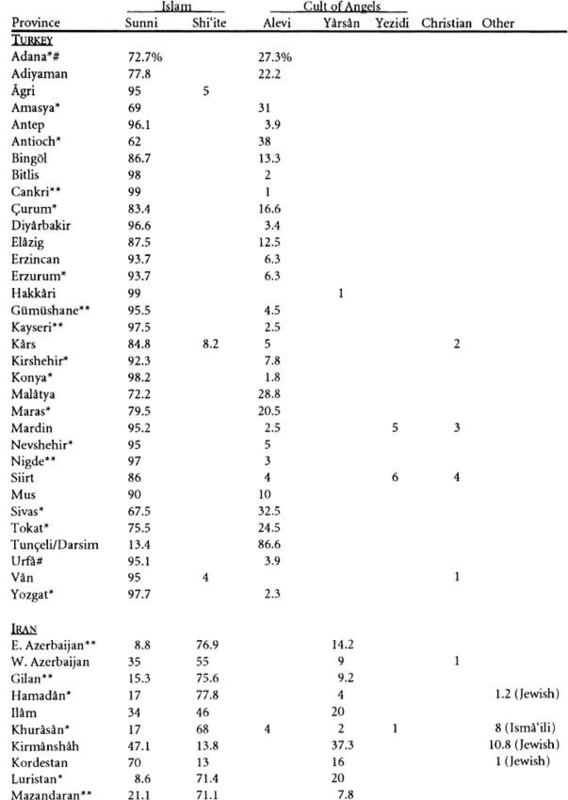 From various state statistics, ethnographic field work, and independent observations set forth in the bibliography, Table 5 quantifying the religious composition of Kurdistan has been constructed. 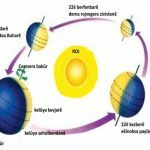 Very valuable background information on Islam, its denominations, cults, and movements, as well as on non-Islamic religions that have influenced or come into sustained contact with Islam during and shortly before the Islamic era can be found in the Encyclopaedia of Islam, 2nd edition (1960-present). The 1st edition (1913–36) should also be considered, as the second edition is not yet complete. Encyclopaedia Britannica is also a valuable resource, particularly for the pre-Islamic religions and movements, such as Zoroastrianism, Mithraism, Manichaeism, and the Mazdakite movement. 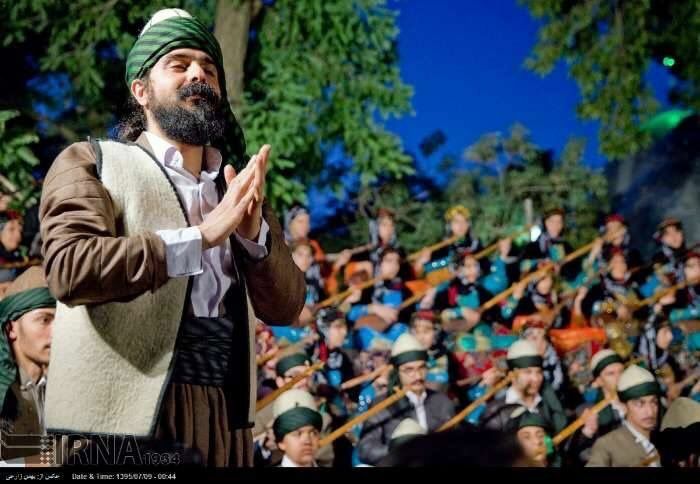 Most non-Muslim Kurds follow one of several indigenous Kurdish faiths of great antiquity and originality, each of which is a variation on and permutation of an ancient religion that can loosely be labeled the “Cult of Angels,” Yazdâni in Kurdish. The actual name of the religion is all but lost to its modern followers, who retain only the names of its surviving denominations. The name Yazdânism or Cult of Angels is a variation of the Kurdish name of one of its isolated branches, Yezidism, which literally means “the angelicans.” There are some indications that Yazdânism was in fact the name of the religion before its fragmentation. An even older name for this creed may have been Hâk (or Haq), which is the name given by this religion to its pre-eternal, all-encompassing deity, the Universal Spirit. A brief argument in favor of the former view is presented in this section under Yezidism. The Cult believes in a boundless, all-encompassing, yet fully detached “Universal Spirit” (Haq), whose only involvement in the material world has been his primeval manifestation as a supreme avatar who, after coming into being himself, created the material universe. (Haq, incidentally, is not derived from the Arabic homophone haqq, meaning “truth,” as commonly and erroneously believed.) The Spirit has stayed out of the affairs of the material world except to contain and bind it together within his essence. The prime avatar who became the Creator is identified as the Lord God in all branches of the Cult except Yezidism, as discussed below. 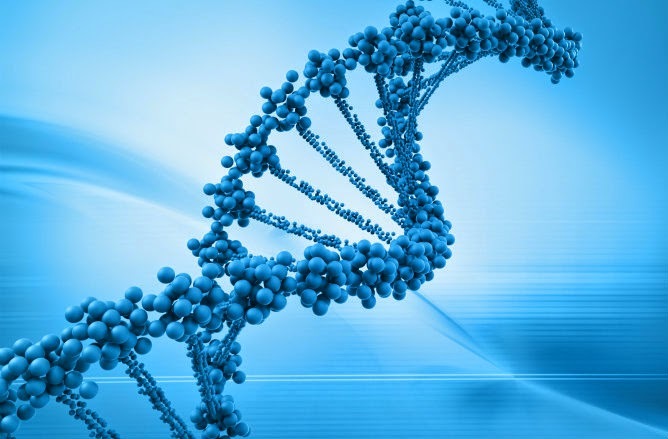 Following or in conjunction with the acts of creation, the Creator also manifested himself in five additional avatars (Bâbâ or Bâb, perhaps from the Aramaic bâbâ, “portal” or “gate”), who then assumed the position of his deputies in maintaining and administering the creation. These are the archangels, who with the Creator and the ever-present Spirit, number the sacred Seven of the First Epoch of the universal life. This epoch was to be followed by six more, a new epoch occurring each time the soul or essence of the avatars of the previous epoch transmigrates into new avatars, to again achieve with the Spirit the holy number 7. Following these original seven epochs and major avatars, new, but minor, avatars may emerge from time to time. However, their importance is limited, as are their contributions, to the time period in which they live. In this century three individuals have risen to the station of Bâb, or “avatar”: Shaykh Ahmad Bârzâni (supposedly a Muslim), Sulaymân Murshid (a Syrian Arab Alevi) , and Nurali Ilâhi (a Yârsân leader). Their impact, however, has been ephemeral. This was not the case with another avatar who appeared a century earlier. Ahmed Barzani (1896 – 11 January 1969) (Kurdish: ئه‌حمه‌د موحه‌ممه‌د بارزانی / Ehmed Mihemed Barzanî‎), also known as Khudan (Arabic: خودان‎), was the head of the Barzani tribe in Northern Iraq. 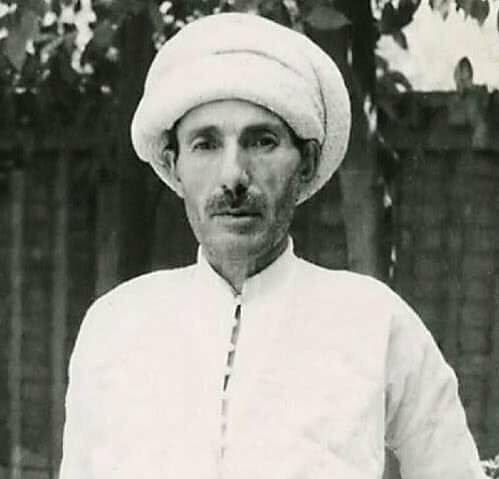 Sheikh Ahmed is considered to be the architect of Barzani Rule and early Iraqi Kurdish Nationalist thought by bringing many different Kurdish tribes under his command and expanding the Barzan region. Along with his younger brother Mustafa Barzani, he fought against the control of the Iraqi government in the 1920s and 1930s. Barzani’s teachings of love, Kurdish Nationalism, tolerance for minorities, respect, equality, sharing of wealth, acquiring knowledge, social reform and environmental protection were unprecedented during his time in Kurdistan. Barzani was the first known Kurdish environmentalist and conservationist leader. He enforced regulations to maintain a clean and sustainable environment. He prohibited, among other things: Cutting down trees, especially those which provide shade and prevent erosion, Overharvesting honey,Killing non-poisonous snakes, Fishing with dynamite and other explosives, Hunting during breeding season.